We all need good friends, but they can be hard to find. We all need community, but it can be difficult to build. This is especially true if we just moved to a new place and don’t already know people already. How can we develop quality friendships and build community? I think the best way to find a good friend is to be a good friend. You can’t just wait for friends to reach out to you like you’re waiting for a package in the mail. You have to take initiative and be a good friend first. But what does it look like to be a good friend? How can we do it? There’s a great verse in Romans 12 that I believe captures the essence of what it means to be a good friend. The verse is simple, but deep: Rejoice with those who rejoice, weep with those who weep (Romans 12:15). How can this verse help us become a good friend? First, rejoice with those who rejoice. It’s important to celebrate when good things happen. Think about how much you loved it as a child when all your family and friends gathered to celebrate your birthday or graduation. There’s a lot of pain and struggle in the world—it’s essential to also mark when good things happen. And it feels great to celebrate in community. So when someone you know has something good happen in their life, be the first one to show up and celebrate. Take them out to lunch or dinner. Throw a party. Write a handwritten note of congratulations and send it in the mail. Bring them a big balloon from Party City. Be a huge cheerleader when good things happen. Second, weep with those who weep. This second point is even more important than the first. Pain and struggle are a constant in our lives. People lose jobs. People get sick and have to stay in the hospital. Relationships break down and end in divorce. Pregnancies that started off so hopeful and full of joy end in miscarriage. People pass away. When pain and sorrow come into the lives of those around you, show up. Be there and offer your presence. Ask if you can pray for them. Send a card. Bring a meal. Attend the funeral. Offer your shoulder for your friends to cry on. It’s simple advice, but it works. 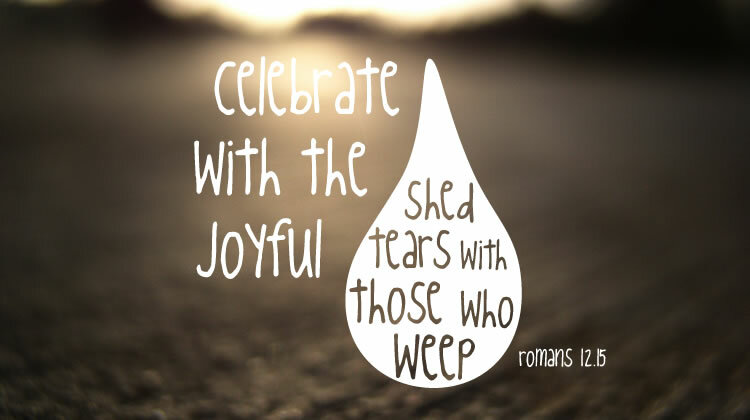 Rejoice with those who rejoice, and weep with those who weep. It doesn’t cost a lot of money. But it does involve being consistent and showing up. It involves putting someone else’s feelings above your own. But the investment is worth it, because that is how friendship and community is built.